The Cardinal head south to take on their inter-state rivals, the Trojans. The game starts at 5 pm (pacific) and will be televised on ABC. 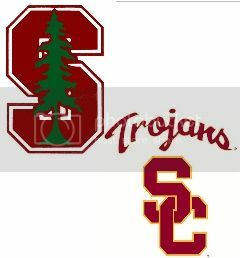 Stanford, ranked fourth in the BCS standings, are 8-1 overall and 6-1 in the Pac-12. They're coming off a 26-20 win at Oregon on Nov. 7. USC (4-2, 7-3), won at Cal, 62-28, on Nov. 9. Vote in the poll and come tell us what you think. For the life of me I'm confused as to why anyone thinks USC is "relevant." To be clear, they are not. Go Stanford! Show these prissy L.A. boys who the best in the Pac-12 is! Ha! They really are prissy! We've got this! Sorry, but I'm pulling for USC. Go Condoms!! Montgomery ran a whole lot to get to the 22 on the kick return. Sorry, Stanford's going to win! Thanks. One of my favorites! Hogan fooled his own lineman. Not good. Not the start we want. We'll bounce back. Shoot. Montgomery should have had that. He took his eyes off the ball. Could have been a facemask on the receiver, who committed his foul first.